Diabetes is serious. So why aren’t patients getting more treatment help? Doctors, hospitals, health officials, and disease advocacy groups race to warn about diabetes’ risks, harms, and increasing prevalence. But why, then, doesn’t modern medicine also do much more to help diabetics with the skyrocketing costs of their care, whether with insulin at excessive prices or with expensive medical aids? Ted Alcorn of the New York Times drilled down on one slice of diabetes care to capture how medical profiteering distorts what ought to be a more direct, simple, and less pricey treatment for a disease that afflicts as many as 100 million Americans in varying degree. 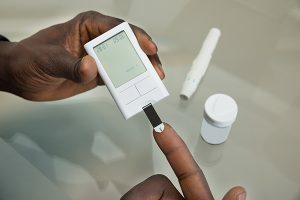 He reported on the “strange marketplace” for the chemical-imbued plastic strips diabetics use to test their blood sugar, inserting them into specialized meters for glucose readings. Before diabetics adjust their diet or take insulin, they may test themselves with strips and meters as many as 10 times a day. The costs add up. Diabetics can pay thousands of dollars annually to get test strips over the counter. But here’s the crazy-making: Alcorn reported that just four companies globally make the strips. They vary greatly in price, depending if patients have health insurance and how generous its coverage may be. Diabetics better off may have ample supplies. They also may find themselves barraged with more boxes and boxes of them, as companies try to convert them to their meters and provide strip samples that work just with their machines. For the have-nots, a “gray market” has sprouted. Alcorn reported that, unlike prescription drugs and many other medical devices and supplies, no laws prohibit re-sales of unused, un-opened boxes of test strips. So, middle-men buy them, say, for $35 for a box of 100. They resell them, especially now online, for $60 — cheaper still than the drug store retail cost of more than $160. [C]ritics argue that the price of insulin has far outpaced any innovations. In the past decade alone, U.S. insulin list prices have tripled … In 1996, when Eli Lilly debuted its Humalog brand of insulin, the list price of a 10-milliliter vial was $21. The price of the same vial is now $275. Those costs can be compounded by the multiple vials that diabetics may require to survive each month … The global insulin market is dominated by three companies: Eli Lilly, the French company Sanofi and the Danish firm Novo Nordisk. All three have raised list prices to similar levels. … Sanofi’s popular insulin brand Lantus was $35 a vial when it was introduced in 2001; it’s now $270. Novo Nordisk’s Novolog was priced at $40 in 2001, and as of July 2018, it’s $289. Stanley has written a painful dissection of the plight of Alec Raeshawn Smith, a young diabetic who got overwhelmed by the cost of his care when he aged off his parent’s insurance and tried to pay for himself as he was getting started in his working life. Like more than 7 million Americans who must take insulin with its ever-soaring prices, he struggled. The cost for his care, with insulin — and remember those test strips and the meter — amounted to $1,300 a month. That was $200 more than he earned as a restaurant manager. So, apparently, as he suggested to friends and parents he might, he skimped and “rationed” his care, notably his insulin injections. He died of diabetic ketoacidosis — a lack of insulin, the coroner ruled. His case may be extreme but the risks he took may be more common than doctors would like: A small Yale University study found that one in four diabetic patients at a clinic in New Haven, Conn., admitted to cutting back on insulin use because of cost. In my practice, I see not only the harms that patients suffer while seeking medical services but also their struggles to access and afford safe, effective, and excellent medical care, especially with the explosive increases in the costs of medical devices and prescription medications, some that prove to be dangerous drugs. Diabetes is far from a new disease. We know how to treat it. Why must patients feel like their medical care is discovering and treating something new or exotic? As patients and the nation grapple with medical costs, it isn’t helpful that doctors and advocacy groups keep pushing the measures to diagnose diabetes, deeming rising numbers of Americans “pre-diabetic,” a category potentially so large as to lack usefulness. Diet, exercise, and weight control can keep many of us away from a diabetes diagnosis — and falling into the clutches of Big Pharma, medical device makers, and others who would love to profiteer off our ills. Stay away, too, from damaging excess sugar consumption, especially through sweet sodas and other drinks. Big Sugar, research shows, has campaigned — including in deceptive fashion — to hook you into its harmful over indulgences. Meantime let’s hope that new lawmakers pass new measures and pressure regulators, Big Pharma, and medical device makers, so diabetics don’t find themselves in dire financial and health condition. It’s unacceptable that insulin, whose discoverers committed a remarkable act of unselfishness and declined personal riches to ensure the health of tens of millions of diabetics, would see the drug’s modern legacy be pharmaceutical profiteering. Doctors blame Big Pharma and its platoons of middlemen, all while also expressing anger at insurer games-playing with insulin coverage. It’s also hard to imagine how contemporary medical device makers sleep well, either: Those pricey diabetic test strips? The New York Times reported they cost about a dime each to make.